PHILADELPHIA — Southern California activist Kanji Sahara was among the honorees at the Japanese American Citizens League’s 2018 national convention, held July 18 to 22 at the Sheraton Downtown Philadelphia. Sahara, who was named JACLer of the Biennium, was born in Hiroshima and came to Los Angeles when he was 6 months old. During World War II, his family was incarcerated at Santa Anita Racetrack and the War Relocation Authority camps in Arkansas, Jerome and Rohwer. He received a BS in electrical engineering from the Illinois Institute of Technology and his Ph.D. from Northwestern University. Sahara worked for General Dynamics in Pomona and became an engineering supervisor. He and his wife, Jane (nee Sakata) raised two children, Richard and Judy, in Claremont. Among the many positions of leadership he has held are president of the East San Gabriel Valley Japanese Community Center in West Covina, project director of the Tuna Canyon Detention Station Coalition’s traveling exhibit, and vice president of the Greater Los Angeles JACL. He is also involved with the Historic Wintersburg Preservation Task Force in Huntington Beach. 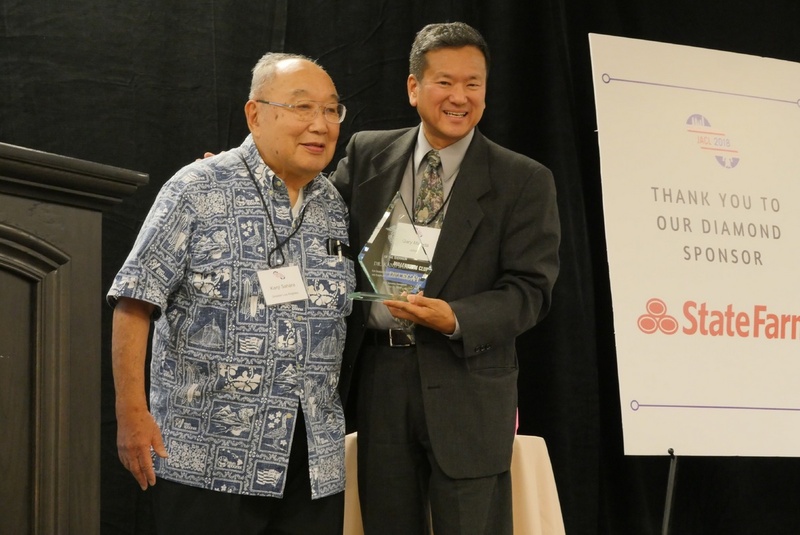 The recipient of this award is the JACLer who has contributed the most to the strength and growth of the JACL during the 2017-2018 biennium. • President’s Community Partner Award — Comcast for its support and outreach to the Japanese American and broader Asian American community in Philadelphia and nationally. The award was presented to Senior Executive Vice President and Chief Diversity Officer David Cohen. Comcast was a Diamond Level sponsor of the convention along with State Farm. • JA of the Biennium — Diane Narasaki (Business/Industry), Harriet Miyamoto Beleal (Education/Humanities), Lynne Nishijima Ward (Political/Public Affairs/Law). All of them have received regional and national recognition for achievements in their respective fields. This is the National JACL’s highest public award. Narasaki is the longtime executive director of Asian Counseling and Referral Service in Seattle. Beleal has educated the public about the little-known wartime incarceration of Japanese Americans in Alaska. Ward is executive director of the Utah Educational Savings Plan. • George J. Inagaki Chapter Citizenship Award — Seattle JACL for its exemplary work in chapter engagement. From its large board size to engage new and youth members to its intersectional efforts to work with others in the Seattle community, the chapter sets an example of energy and activism. • Edison T. Uno Civil Rights Award — Mitsuye Endo (1920-2006) for pursuing her Supreme Court case, Ex parte Endo, during World War II on behalf of incarcerated Japanese Americans. Although the ruling did not overturn the exclusion, it led to the return of Japanese Americans to the West Coast and the closure of most of the camps. • National Youth/Student Council Vision Award — Beckie Masaki, social justice and community building director at the Oakland-based Asian Pacific Institute on Gender-Based Violence. • Indefinite Detention at the Border — Emergency Resolution 1 pertains to the U.S. immigration policy authorizing the indefinite detention of undocumented immigrants without due process, including asylum seekers. This resolution cites Flores v. Reno, Attorney General Jeff Sessions’ adoption of a zero-tolerance policy and President Trump’s executive order separating children. JACL supports due process for all, the end of indefinite detention of immigrants, protection for those seeking asylum, and ensuring that former incarceration sites not be used as modern-day concentration camps. • Muslim Ban — The second emergency resolution passed relates to the U.S. Muslim ban. The resolution relates Japanese American mass incarceration with the current treatment of Muslims and those perceived to be Muslim. This resolution calls on JACL to continue to oppose discriminatory government policies directed to Muslims, South Asians, and Sikhs. In order to stand in solidarity, JACL commits to strengthen coalition and support with various Muslim civil rights organizations and to call on Congress to protect citizens against the detrimental impacts of this executive order that was upheld by the U.S. Supreme Court. Outgoing board members Gary Mayeda, Alan Nishi, Michelle Amano and Kenji Kuramitsu were thanked for their commitment to JACL and for donating their time and service.